Guys and Dolls is a classic American musical, derived from Damon Runyon's stories about gamblers, hustlers and show biz characters of 1930s New York, with outstanding songs by Frank Loesser. Its Broadway premiere lasted from 1950 to 1953, and it's been revived there five times since -- the most recent Broadway run ended this June. The 1955 film is also a classic. In fact, it's so classically theatrical that it is also a perennial production of high schools and junior highs. But for regional theatres especially, that should be as much a warning as a promise. In other words, thinking it's a sure thing is the type of thought that a sucker may live to regret he ever had. Guys and Dolls follows two interrelating stories: Nathan Detroit, trying to find a location for his permanent floating crap game while fending off the matrimonial expectations of his showgirl fiancé, Miss Adelaide, while high roller Sky Masterson works on winning his bet that he can entice the strait-laced young lady from the Mission, Sarah Brown, to accompany him to Havana. It's now on stage at North Coast Repertory in Eureka, directed by James Read, with scenic design by Lonnie Blankenchip, choreography by Heather Sorter, costumes by Marcia Hutson and musical direction by David Powell and Dianne Zuleger. This production has many virtues: Melissa Smith's transcendent voice as Mission lady Sarah Brown; the strong, goosebump-raising ensemble singing, particularly of Evan Needham (as Benny Southwest), Ethan Vaughan (Rusty Charlie) and David Powell (Nicely Nicely Johnson), as well as everything Powell did, especially leading the gangster revival song "Sit Down, You're Rocking the Boat." Last and most consistently the best is the acting and singing of Andrea Zvaleko as Miss Adelaide. She was funny and musical and created an appealingly real character. Daniel Kennedy had his virtues as Nathan Detroit, and Trevor Mather -- evidently a late addition as Sky Masterson -- played the role with a presence and a heart that conquers all, even the sometimes-elusive musical key. But it was Zvaleko's performance that kept the evening on track. Aspects of the opening night performance seemed under-rehearsed, so by now the show could already be better. But some problems suggest that tapping the full magic of Guys and Dolls can be tricky. For all its high points, this production isn't helped by some clunky and confusing staging, ragged acting, questionable choreography, unfortunate costumes and an uninspiring set. Mostly missing for me was a consistent sense of time and place: What makes the New York of this era different from, say, Chicago or Paris? The major exception in all this was Zvaleko, who managed to keep her Betty Boopish accent even while sneezing. 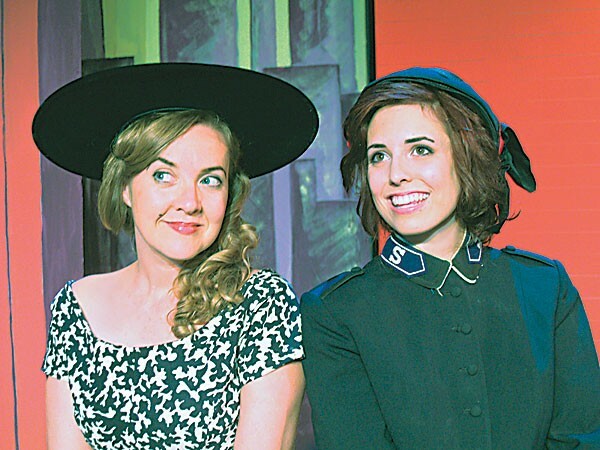 North Coast Rep usually excels at these classic musicals. Though this may not be among its best, there's potential fun and some special moments in Guys and Dolls. Coming Up: Jeff DeMark performs his baseball show Hard as a Diamond, Soft as the Dirt with The Delta Nationals in the Arcata Theatre Lounge on Saturday, Sept. 26, at 8 p.m. The show is followed by dance music by the Nationals. Ferndale Rep has announced its intriguing season: Beth Henley's family drama Crimes of the Heart opens Oct. 8, followed by the musical Oliver! in November, the mystery Wait Until Dark in February and the Don Quixote musical Man of La Mancha in April. Also in April, the teen company revives the satirical Beyond the Fringe. The regular season ends with Same Time Next Year in May and the musical Rent in August. Dell'Arte is packaging its company and student performances into a formal season this year, beginning with Joan Schirle in Inverted Alba, opening Oct. 9, followed by the Commedia Christmas Carol in November and an evening of Spanish language theatre with HSU's Teatro Hispanico in December. In March there's a Dell'Arte Cabaret and another community-based project. Dell'Arte School's second-years do adaptations in December, tragedy in April and storytelling in June. The first-years perform commedia in February, melodrama in March, and clown around in April. Then there's the Thesis Festival and the Finals in May, and the Mad River Festival in June. HSU's Theatre, Film and Dance department combines with the Music Department to start its season with the musical City of Angels beginning Oct. 22. After a first screening of a new feature film by HSU's David Scheerer in November, Christopher Durang's comedy The Marriage of Bette and Boo opens in December. Harold Pinter's drama The Homecoming follows in February, Mark Medoff's fantasy Stefanie Hero in April, as well as the annual spring trifecta of the dance show, Humboldt Film Festival and the Ten Minute Play Festival. In the blogosphere: Calder Johnson, who has done nearly everything (act, stage design, lighting, etc.) for just about every theatre on the North Coast, has started a blog as an outgrowth of his thesis on sustainable theatre, at sustaintheatre.blogspot.com. Apart from my Stage Matters blog (stagematters.blogspot.com), it's the only locally produced blog on theatre I'm aware of. If there are others, please let me know.